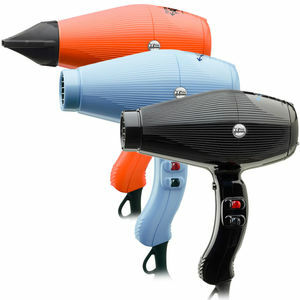 Ultra-lightweight ionic Italian-styled dryer with cool shot. The Gamma Piu Aria Dryer is all about lightness. Weighing in at an incredible 380 grams, the Aria Dryer uses cutting-edge components to allow exceptional performance at the lightest of weights—making it ultimately easy-to-handle! It has 2 speed settings, 3 heat settings and a cold shot button. There's also a tourmaline-coated grid which generates negative ions to condition hair as you dry for a shinier, healthier finish. The Aria is incredibly quiet too, but despite that delivers a professional performance with a high temperature and enough power to reduce drying time. Available in 3 colours: Aquamarine, Black or Orange. £98.40 (inc. VAT) Why no VAT? We're a trade wholesaler and quote our prices without VAT to help our VAT-registered customers understand the true cost of a purchase.